Day one is done and dusted. For those who weren’t there here’s a quick chronological recap. Our first years were welcomed this morning by the staff of St Munchin’s. Their first day was a short one kicking off at 9am in the Assembly Hall with full time in the same venue four hours later. 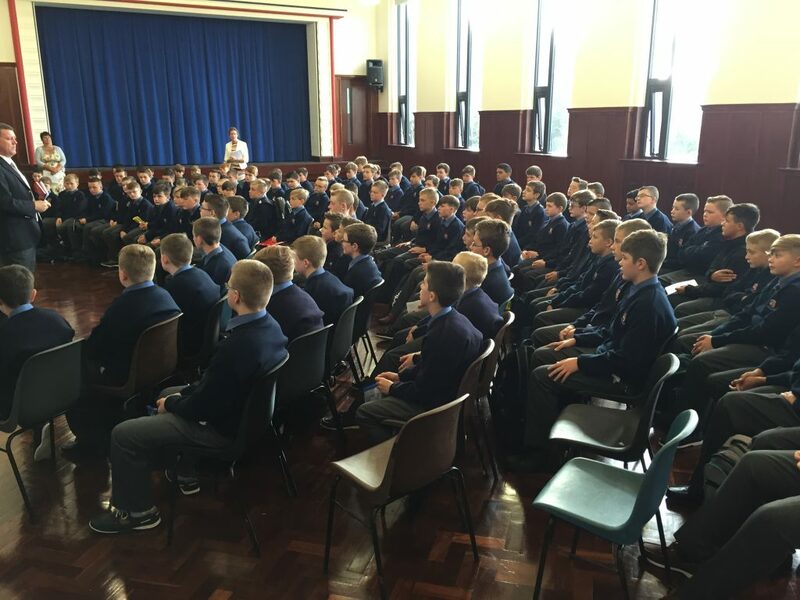 Principal and Deputy Principal, Mr. Quilter and Mr. O’Donoghue, introduced themselves and spoke of the traditions of St Munchin’s and the expectations but also the opportunities and possibilities that were now within the grasp of these young men. Chaplain Ms. O’Sullivan-Glynn then gave a reflection which spoke of the promise that awaits the boys in the years ahead. Year Heads Ms. Bourke and Mr. Kelly then explained their pastoral role ably supported by tutors Ms. Coone, Mr. O’Brien, Ms. Fay and Mr. Murnane and the entire staff of the school. Our 109 new lads then marched off to their tutor rooms where they went through the key parts of the Journal, the school rules, the time table and general introduction to secondary school. Then it was a whistle stop tour of the campus, a stop off in Mr. Nelligan’s room to collect their sports gear and an orderly queue for Ms. Keehan to get their locker key. With their heads fried from all this new information it was time to withdraw to the canteen for a spot of lunch. The Year Heads got the boys to move around meeting the strangers who will soon be their buddies and mates for this year and maybe the rest of their lives. Soon the canteen was a hive of conversational buzz. Off to the yard at midday to play soccer, tag rugby and basketball and break whatever might be left of the social ice. Finally, red faced and chests heaving from their sporting exertions, it was back to the Assembly Hall to be reminded to bring home their journal, sports gear and locker key. There is poetry in the thought that it will be in the self same Assembly Hall six years from now that these lads will sit their final Leaving Cert exam before saying adieu to SMC. But there’s a lot of life to be lived and a lot of learning to be learned between then and now. To all our new boys a big Munchin’s welcome. PS – some reminders for parents. You can come to the College any time tomorrow with your son to help him sort out his locker. Your son does not need to wear his uniform on this occasion. Please read and sign your son’s journal (Pages 16 and 38). Please note that mobile phones are not allowed in first year. Should your son need to ring home he can do so from the office phone. It is in your son’s interest to come to school for 8.30am so that he can organise his day without stress. There will be a coffee morning next week and an Information Night for first year parents to follow. 0 responses on "First Years First Day"